I've been starting my day with freewriting and this morning Zehra Cranmer asked if I'd do a blog post about it. So here it is, Zehra! Freewriting is simply writing without pausing. You can type. You can write longhand. Not pausing is the only rule. So how do you know when to stop? That's up to you. Some people set a timer. This is a good strategy if you have a difficult time settling in, stilling the outside mind-chatter, and writing. Figure out what amount of time you need to spend before you stop jumping up or feeling the need to click over to another screen. Sometimes it only takes five minutes of constant writing to find your zone. I also use the timer if I'm worried about something and that thing keeps intruding on my writing time. I'll say to myself, "Self. . . you have ten minutes to obsess on this. Go." Then I dump it all. After ten minutes, I'm done. It's time to move on to something else. Setting a timer also works if I'm trying to answer a plotting question. In this situation it becomes more like brainstorming. Instead of letting my mind wander where it will, I tell myself to answer something specific. I might freewrite for ten minutes, trying to find a name for my character, running through all that name's associations to different names or settings or circumstances. This is a great strategy if I'm avoiding a problem in my manuscript. Or if there's something that's bugging me about a scene, but I can't quite put my finger on it. Instead of looking sideways at the issue, I make myself focus for ten minutes and I'm done. So that's one way to know when to stop: set a timer. Another option is to write until you're done. This is great for times when you have a million things you need to purge before you can relax into your writing. Your to-do list is rattling around in your mind, making too much noise. Or you're worked up about something in the news or something in your family. There's a point when you have to dump all the brain clutter so you can focus. Freewriting is a great way to do it. When your fingers quit racing and your mind settles, you're done. Another option---and the one I've been doing lately---is to write until you reach a certain number of words. I've been doing this because the first thousand words of the day are always the most difficult for me to write. After 1000 words, solid bricks of words become liquid. One thought flows into the next. Usually I write those words into a novel or a story and then I have to go back and revise like crazy. I don't know why it took me so long to realize I need to warm up with disposable words. Well, yes. Maybe I do know. It's the idea of it. The idea of throwing away 1000 words every day makes my heart race a little. The idea became a lot more palatable when I timed myself. I can easily freewrite 1000 words in 15-20 minutes. At the end of that time, my thoughts flow. When I attempt to dive straight into a novel or story, it usually takes me an hour to write 350 words. In the second hour I write 500 words. In the third hour I take off. Why? Because I don't cross 1000 words until that third hour of novel writing. That's how many words it takes before I find fluidity. To make matters worse, those first thousand words need more revising than the rest. If I do my freewriting warm-up, I'm in the flow of the novel or story from the first words I put down. If I spend 20 minutes burning off first words, I write better and more in the time remaining. Thanks for the question, Zehra! Do remember that none of this is set in stone. Adjust and modify the process into something that works for you. Right! I am doing this! Thank you so much for helping me out, I know that this will unlock the writing mind, what a magical way of warming up those brain muscles! And once more, thank you, always! I have used the timer to get my thoughts rolling on a rough draft. I never considered warming up before working on my story. Intriguing idea and the thought of giving ten minutes to a problem, then moving on is great. 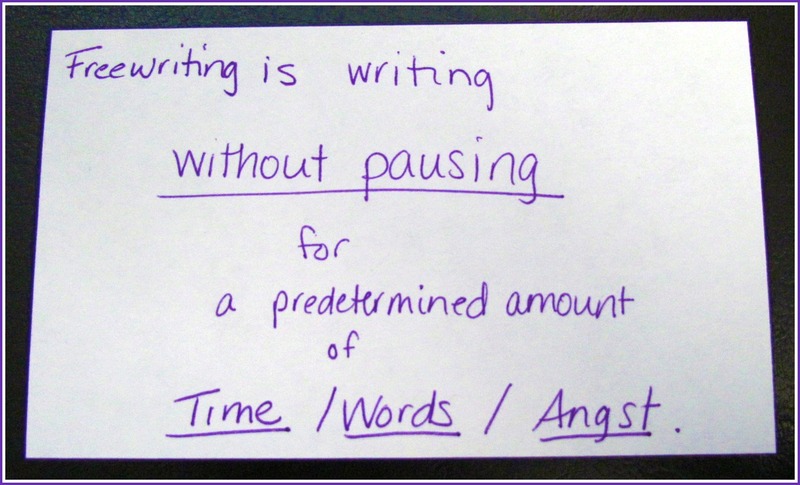 Writing without a pause-a great way to tune out and get in the groove. The other day on the train I became aware of my inner voice, the fact that it is endlessly making a noise, it cannot be turned off. This was so traumatic that I almost collapsed. I can't wait to try some free writing! I think I'll try it too. I've been having trouble getting back in the groove since the holidays. Maybe this is what I need. Hi Johanna, I agree that writing seems to flow freer after you get the first 1,000 words of the day out the way. I am interested in how you do your freewriting before you start on your novel. Do you write 1000 words on your novel itself? Or 1000 words about something else entirely? It's amazing how often I filter out the really good ideas. In freewriting I see things I'd otherwise miss. Of course, sometimes it works the other way too. I'll be harboring an idea I think is amazing, but I freewrite it and it has much less substance than I thought it did. I too often lean toward endless research and mulling. Using a timer limits that. Yes. I have to still my inner voice to write. It always gets between me and the story, even when it thinks it's helping. It has to hush so I can see the scenes unfolding. Escaping into a book (whether reading or writing) allows me to be free of the chatter of that inner voice---such a relief. It usually works that way for me. When I find the flow of words, I want to keep writing. Those first words are the difficult ones. The warm-up words are separate from the novel. I can write on a topic connected to it or write back story or capture scraps of dialog that don't fit into the novel yet. All of those things are fine, but I don't try to add material directly to the novel until I'm warmed up. One of the best free writing aids one could find is Write or Die (http://www.writeordie.com). It has several incentives to keep you writing and to silence your inner editor. On the strictest settings if you don't keep writing it will begin to delete what you have already written. I find it quite useful to get me started and to keep me going on days when my brain just won't stop but my fingers just won't begin. I was hoping someone who uses Write or Die would mention it! My daughter found another take-off of that---a site that has picture of a cute kitten pop up every time a word count goal is met. I can't find a free version..... does it exist ? There's a web version that's free. If you click on the tab on the left side, it's there. 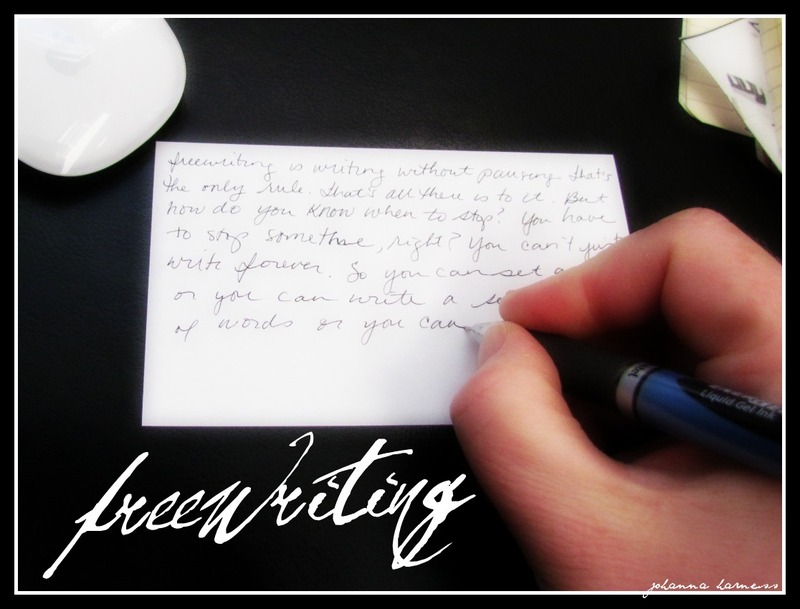 Freewriting is such a simple yet effective way to prime the writing pump. I've used it in the past, but it fell out of my arsenal for some reason. Perhaps it's time I picked it up again. Thanks for sharing your experiences with it, Johanna. Definite food for thought. Walking is like meditation for me and I usually go for a walk when I'm stuck. But this also sounds good and I have used it when stuck on a plot, but I've never used a timer. I'll have to give it a go. This is a helpful blog and I'm glad I found it.